MBA student Rosie Rodriguez blogs about studying abroad at London Business School. As someone interested in the intersection of business and society, this is a great chance to gain international experience, develop a global business perspective, and expand my network on and off campus, all while getting a world-class education! 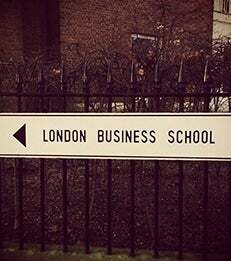 Hi, my name is Rosie, and I am a second-year MBA student spending my Spring semester at London Business School (LBS). I came to Stern to transform my career by taking advantage of all the opportunities to immerse myself in global business. The highly international nature of the LBS program is greatly enhancing my MBA experience. It complements my professional and personal interest in international development. So as someone interested in the intersection of business and society, this is a great chance to gain international experience, develop a global business perspective, and expand my network on and off campus, all while getting a world-class education! Much like Stern, the people are what make LBS and London great. It is such a treat to connect with Sternies, fellow exchange students, and of course our classmates from LBS. The last four weeks were jam packed with adventures in London and beyond. At the start of the semester, Zach Erdmann and I organized a group lunch and visit to The National Gallery so that we could get to know our new friends in the program. Almost every class at LBS includes a presentation from really engaging business leaders. Speakers have joined us from Arsenal Football Club, AB InBev, Expedia, The London Organising Committee of the Olympic and Paralympic Games, Jarin Capital, and many more. On Thursday nights everyone heads over to Sundowners, which is the LBS community’s weekly get together. As the unofficial start to the weekend, this is a great chance to catch up with new and old friends over a few pints. A big group of Sternies caught the Eurostar over to Paris for a long weekend. We had a great time exploring the city and enjoyed some amazing French cuisine. I am a huge fan of the English Premier League. As an Arsenal supporter it was amazing to snag a ticket to see the Gooners 2-0 defeat of Fulham at Emirates Stadium. Outside of LBS, I joined Run Dem Crew, a collective of creative types with a passion for running and the exchange of ideas. We meet every Tuesday night to run and explore the streets of London.